Webpage by Owen Ogletree. Photos by Owen Ogletree & The Beer Wench. After hitting Belgium in 2009 and England in 2010, Owen Ogletree decided to take his annual group beer trip to Deutschland in 2011. On the trip were reps from Terrapin Beer Company, Taco Mac, Leon Farmer Beer Distributors, Bell's Brewery, Clipper City and Great Western Maltings. Check the photo album below for all the remarkable places we visited and beers we enjoyed. Useful links are at the bottom. Jet-lagged but ready to party -- our first beer of the trip was at the chilly Hacker-Pschorr cafe on the Marienplatz in central Munich. For lunch, our group enjoyed Oktoberfest chicken and fresh beers upstairs in the grandiose Festhall of the famous Hofbrauhaus. Hofbrauhaus' Festhall includes an interesting museum filled with artifacts. Our next stop that afternoon was the historic Augustiner Großgaststätten beer hall (Neuhauser Strasse 27). Augustiner offers some of the best lagers and wheat beers in all of Munich. Dean, Gail and Kerri agree. Spike gives the Augustiner beers a thumbs-up. Day two began with an early morning tour of the huge Spaten Brewery in Munich. Spaten offers visitors a cellar museum filled with old displays and brewing equipment. Paparazzi seem to follow Dustin and Terri on these beer trips. Brian and Dustin sing "hail to the hops" in the Spaten museum basement. Spaten and Lowenbrau have merged, and Spaten's museum includes many old ads and posters for a variety of their beer brands. Not a Dalek, but an ancient bottling machine at Spaten. Tina poses alongside a display of cooperage tools from long ago. We enjoyed fresh, delicious beers and lunch inside the Spaten meeting hall on the top floor of the brewery. Bob and Spike enjoy the Spaten and Löwenbräu beers... and pretzels. We had pretzels with every meal -- including breakfast. After Spaten, we squeezed in one beer at the personable Löwenbräu tavern -- just around the block from the Spaten Brewery. Any beer lover visiting Munich (München) should certainly pay a visit to Lukas at the enjoyable Munich Bier & Oktoberfest Museum (Sterneckerstr. 2). After Lukas' tour of the museum, the group snacked on pretzels and sampled several excellent lagers and wheat beers from the region. Dinner on day two took place at the central Munich Weisses Brauhaus Schneider tavern (Tal 7). Look at the size of that schnitzel on Brian's plate! Size does matter! Day three kicked off with a quick visit to the beautiful Neuschwanstein Castle just SW of Munich. Kerri and Owen are pictured above. After living like kings at the castle, our tour bus brought us to the amazing Ayinger brewery for a tour and tastes. The crowd enjoyed the perfect Ayinger beers in the brewery's tavern and meeting hall. Yes, those are the tops of the real brew kettles in the background. Donald and Fred from Taco Mac enjoyed a beer and a chat with Ayinger's Gertrude Hein-Eickhoff. Otto, our friendly tour guide, manned the bar in the background. Pictured above (L-R): Ayinger's in-house beer sommelier, Ayinger owner Franz Inselkammer (the elder), Owen Ogletree, and Franz Inselkammer (the younger) shared a scrumptious beer in the Ayinger Guest House kitchen. At dinner that evening in Aying, Owen Ogletree stuck a red hot poker in Kevin's glass of Celebrator. Kevin seemed perplexed. This ancient practice caramelizes some of the sugar in the dark beer, producing delightful, cookie-like aromas and burnt toffee flavors. Franz enjoyed meeting our group and was the perfect host. 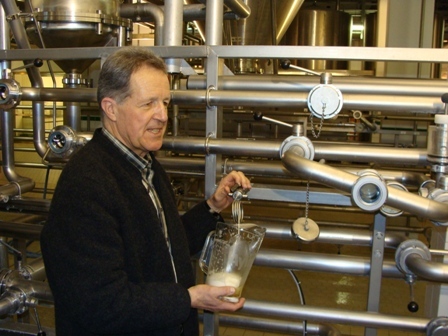 Tour guide Otto allowed the group to sample Ayinger Jahrhundert export lager straight from the secondary tanks. This unfiltered sample truly showed off the complexity and excellent quality of the beer. Don't go in the back of the tour bus -- trust me. Everything on the bus was fine until Spike passed around a 40 oz. can of Faxe 10% ABV Danish malt liquor! Here's the whole crowd outside Weihenstephan brewery and brewing school on the morning of day four. 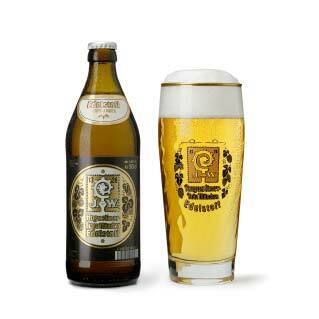 Weihenstephan is world-renown for their dry, complex Hefeweizen. The lunch at the Weihenstephan tavern was one of the best (and most filling) of our trip. Ed raises his glass of Weihenstephan Dunkel Weiss. That's Harold, our patient bus driver, in the background (the only guy without a beer). A short drive from Weihenstephan brought us to the ultra-cool Hop Museum in the Hallertau region of Bavaria. Brian and Dustin try out the old hop picker's bed in the Hop Museum. Could the hop picker in this old photograph in the Hop Museum be Fred's long-lost, great-grandfather?! After checking into Bamberg's Hotel Weierich, the group split up to pub crawl some of the best taverns in town. Here are Wetzel, Steve, Tina, Fred and Dustin in the old Mahr's pub. Day five had the group meeting for lunch and beer at Bamberg's Schlenkerla Tavern. Schlenkerla produces the world's best smoked lagers (Rauchbiers). Schlenkerla owner, Matthias Trum, spent about 40 minutes discussing beer with our group. Matthias is quite devoted to continuing the historic brewing traditions of his family. After Schlenkerla, next stop was the magnificent Weyermann maltings in Bamberg. Above, the tour guide shows several tons of wet barley being turned by machine agars. Weyermann houses a test brewery that produces some of the most unique and interesting beers in Bamberg. After the tour we all understood why Weyermann malt is considered to be among the very best in the world. After Weyermann, our bus drove about five minutes to the best craft beer bar in all of Bamberg -- Café Abseits (Pödeldorfer Str. 39). 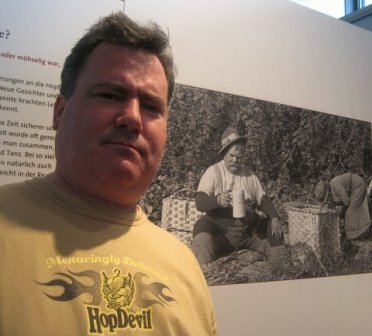 Gerhard Schoolmann, owner of Café Abseits, is a true lover of world class beer. Above, Gerhard discusses one of the Weyermann test beers with Kevin and Spike. Gerhard poses with The Beer Wench. On Day six, we boarded our bus and drove back south toward Munich. First stop was a 10:30 AM tour of the atmospheric Winker Brau brewery and guest house (St.-Martin-Str. 6, Velburg-Lengenfeld). Pictured above are the small, open fermenters at Winkler Brau. Since the Winker beers are not available in the states, this brief stop was truly special for the group. Hamp, Brian, Ed, Jim, Bob and Jeff raise a mug of Helles. Herr Winkler was a delight and even shared a morning beer with the group. Everyone wants to return to Winker one day to spend the night and experience the restaurant and spa. Next on the route back to Munich was the Schneider Brewery in the lovely town Kelheim. Shown above is the oldest known written recipe for Schneider Weisse -- it's housed in the brewery museum. Susi was host and guide for the Schneider visit. 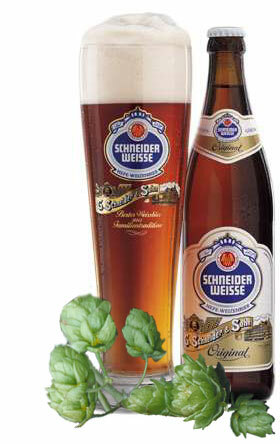 Schneider produces probably the most rich and flavorful wheat beers in the world. Of course, being American hopheads, our group's favorite beer was the clovey, citrusy Schneider Hopfenweisse. It's like a hybrid of Hefeweizen and IPA. Here's Dean in front of one of Schneider's many open stainless steel fermenting vessels. Jeff poses in front of one of Schneider's old barrel fillers. We ended our trip with a huge Bavarian feast at the Ayinger Tavern in central Munich. The Bavarian, family-style dinner consisted of enough meat and side dishes for 60 people. It was memorable and gut busting. Marilyn, Katie, Gail, Dean and Jeff raise a toast to another amazing European beer adventure. Prost!